LAS VEGAS—Belkin got into the connected-home market early with its WeMo brand, and the company announced a significant expansion of that product line at CES today. Belkin showed a raft of new sensors, a Wi-Fi-to-Zigbee bridge, and even tools for monitoring your home’s water and power consumption. That sounds pretty remarkable. 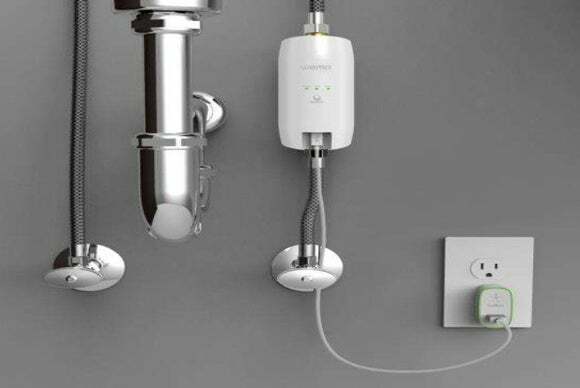 Unlike some other water sensors, however, Belkin’s solution apparently isn’t capable of shutting off your water supply if it detects a leak. Still, being alerted to a water leak would enable you to take quick action, even if you’re away from home, to reduce the extent of any water damage. Two years ago, I returned home after being away for a week to discover a burst pipe spewing water out of the ceiling in my garage. I was fortunate that the damages were limited to the garage, but the repair bill still topped $30 grand. One of my criticisms of WeMo’s lighting control has long been that it depends on a nearby motion sensor. Door/window sensors are a better solution, because the simple act of opening a door can trigger numerous lights to come on. So I’m happy to report the coming availability of WeMo door/window sensors. Like most sensors in this class, you mount one half of the sensor to the door or window and the other half to the door or window frame. The two pieces form a magnetic field and emit a radio signal when the door or window opens, separating the sensors and breaking that field. This type of sensor is also useful for alerting you when other types of doors are opened and closed. You could put one on your liquor and medicine cabinets, for instance, to warn you about unauthorized access. Or they could relay a message to your thermostat that you’ve come home and that your HVAC should go into action. And unlike a motion sensor, they can report the status of a door or window: open or closed. The WeMo Keychain Sensor generates alerts when the person carrying the keyfob leaves and returns home. Affix one to your child’s belt loop and it will let you know when they leave home for and return from school. 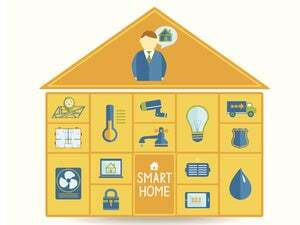 The sensors can also trigger a series of customized events, and it has an integrated button that can activate another WeMo device. Belkin also suggests using it to keep track of pets, but without knowing the keyfob’s range, I can’t say how effective that will be. I would venture to guess, however, that pet sensors with GPS chips would be more effective in this role. Tired of paying monthly fees for your monitored alarm system? If you’re out of contract and have already paid for the equipment, Belkin’s WeMo Alarm Sensor could allow you to take it offline. If you consider that tack, however, remember that the best alarm systems use GSM technology for backup. Burglars know they can cut your phone line to take some alarm systems down, and if they do that, Belkin’s alerts won’t be able to reach you. Control panels with celluar backup can send alerts even without a phone line, and they typically have a battery backup so they can continue to operate during a power failure, too. Belkin’s WeMo Alarm Sensor listens to the noises in your home and generates an alert when it hears your burglar, smoke, carbon-monoxide, or glass-break detector sound off. Create a list of emergency contacts in the WeMo app on your smartphone so you can ask a neighbor or family member to investigate if you’re away from home. I presume you could also add the number of your local emergency responders to that list. If you can integrate this sensor with the rest of your WeMo connected-home system, so that you can have lights come on in the event of a fire, this could be a better solution than the Leeo Smart Alert Nightlight that launched late last year. Belkin already has a motion sensor in its lineup, but it’s limited by the fact that it depends on AC power (and the length of its power cord). The WeMo Room Motion Sensor is a battery-operated infrared model that detects heat signatures. This should render it much less susceptible to being triggered by pets inside the home, and it has much better range: 30 feet with a 90-degree field of view. It can be set up to trigger other WeMo devices, including the WeMo Light Switch. Wi-Fi technology is ubiquitous, but it’s too power-hungry to be used for battery-powered devices. So Belkin has turned to ZigBee chipsets for its various new sensors. But instead of deploying an entire ZigBee hub, they’ve built a Wi-Fi-to-ZigBee Bridge that can relay messages from its sensors to your Wi-Fi router. Belkin didn’t include this last item in its press release, but it was part of a PowerPoint presentation sent in the same press kit. This sensor mounts inside your circuit-breaker box and analyzes electrical signatures emanating from the main power lines entering your home. It sounds very much like the Smappee product that’s already available. Belkin says its new bridge and most of its new sensors will be available in the second half of 2015. The WeMo Water with Echo Technology, however, is still undergoing field trials, Belkin couldn’t say when that product would be available. The company hasn’t released pricing for any of its new products.